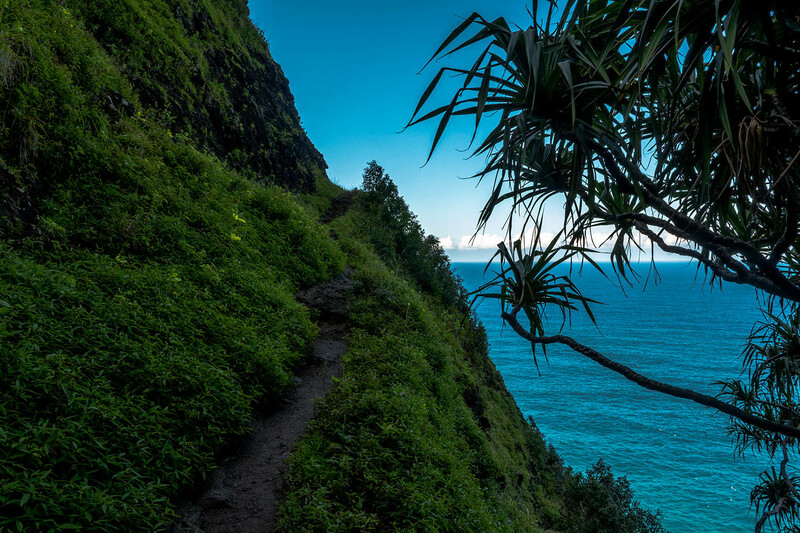 The Kalalau Trail is one of the most beautiful and isolated trails in the world. 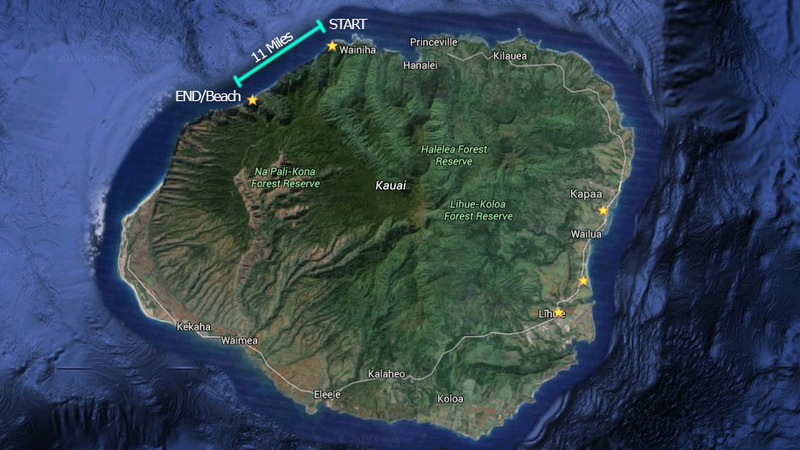 At 22 miles long round-trip, this trail is definitely no joke. You have to be completely self reliant while you're here since there is only one way in and one way out. 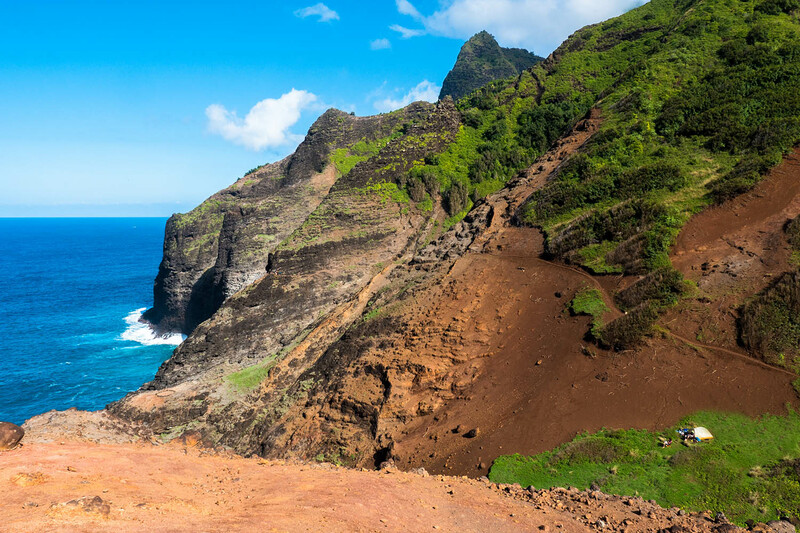 If you do end up in an emergency situation where you cannot walk, your only option is to flag down a coast guard helicopter as there is no reception or means of communication along the trail. The hike/trail ranges from 0 feet of elevation to almost a thousand, and fluctuates ascent/descent the whole time. 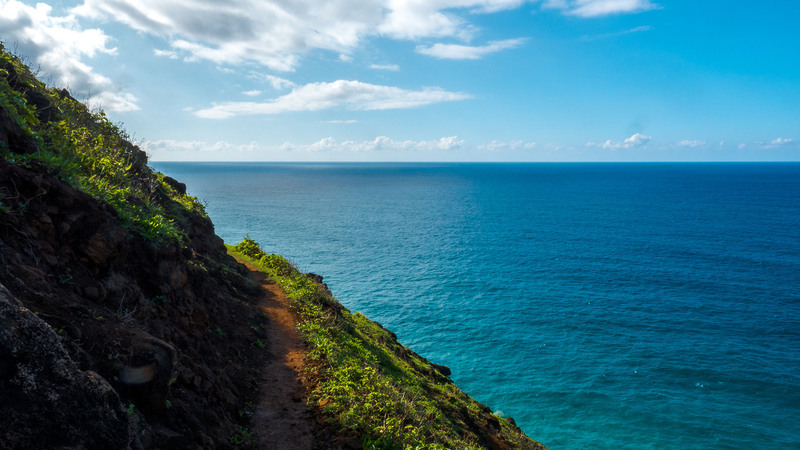 Much of your journey you are inches from the edge of a cliff that drops a few hundred feet into the ocean. 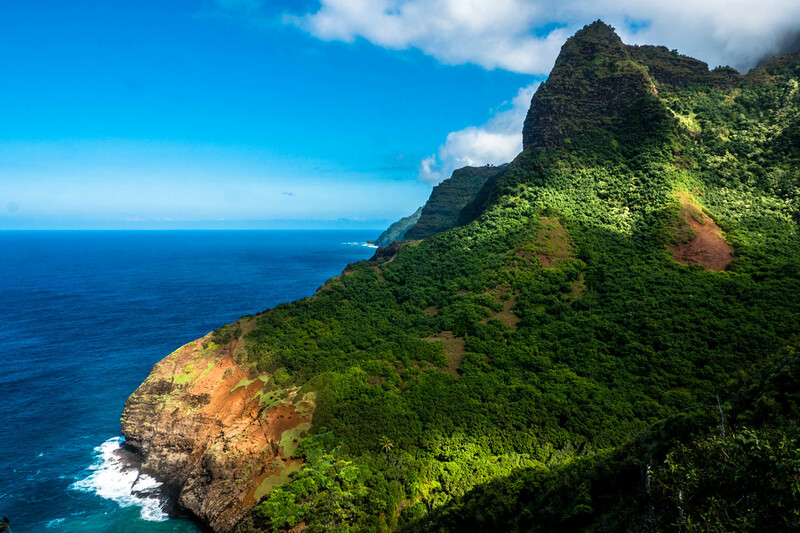 This offers hundred-mile-views of the Pacific and good opportunities to catch a lucky glimpse of a humpback whale gasping for air. 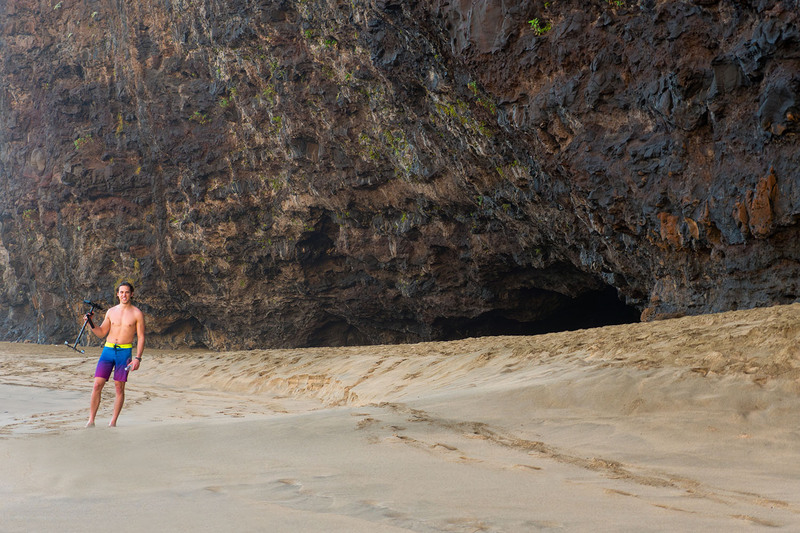 The destination at the end of the trail is a giant beach, untouched by the outside world and essentially a place where societal rules and customs don't exist. You are free to do and be whatever you want. Some people are doing yoga, drinking from waterfalls, honing their photography skills, walking around naked or even hunting for chickens in the forest... It is easy to make friends and share an immediate bond with the rest of the hikers that accomplished this grueling mission. At the end of your quest you will be so tired, so hungry, so thirsty but ultimately so happy that you got to experience something so beautiful, magnificent and different from anywhere else on earth. My friend Colin at the beginning of our hike. Woke up at 6, ate some pizza and got an early start at the trail. This was an epic camping spot of some dude I met along the way. Though not an official spot, he was respectful to nature so it's all good. 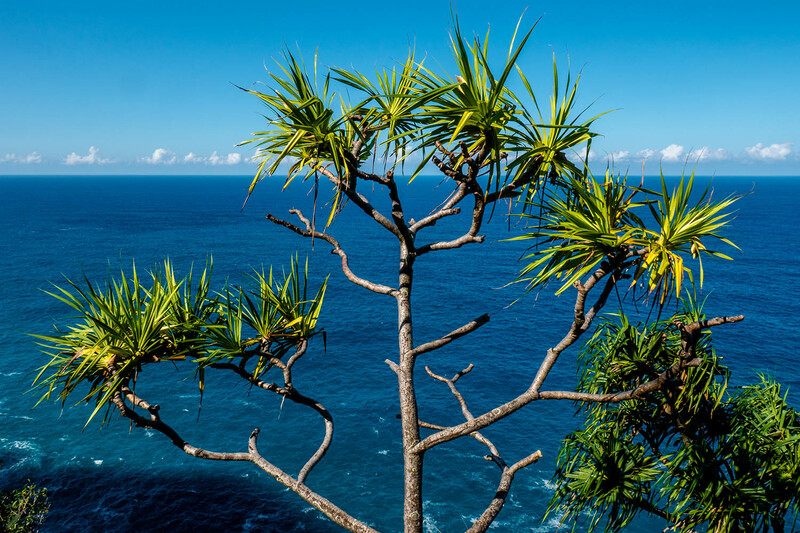 The trail takes you from cliffs to oceans, across rivers and through dense jungle. Many interesting and exotic plants and animals along the way. The Further you get in the trail, the better the landscape becomes. 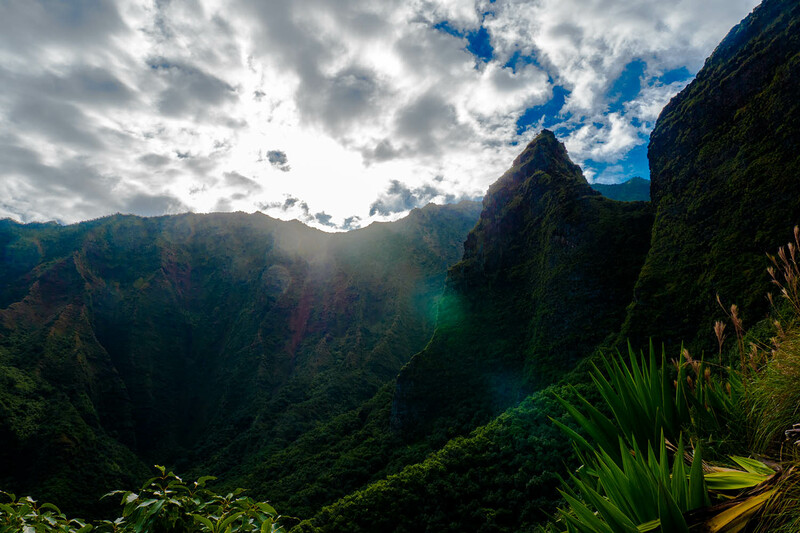 During the first half, you push your way trough some dense vegetation, but as you get past crawlers ledge (around mile 7) everything opens up into a wonderland of green grass and open mountainsides. 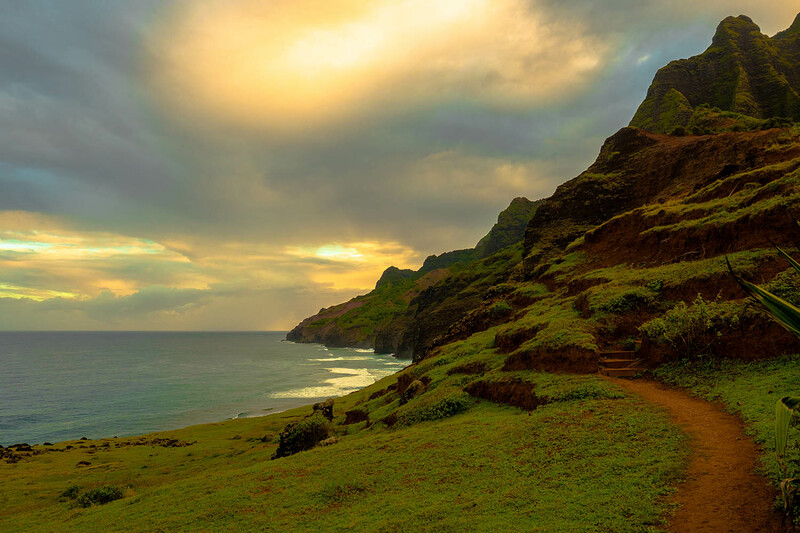 After an all day hike, you finally start catching glimpses of the ultimate destination, Kalalau Beach. 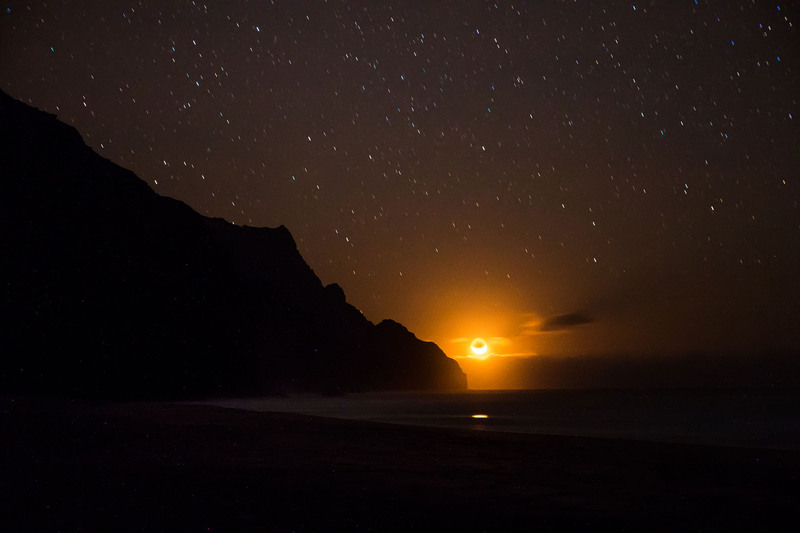 Long story short, I arrived at Kalalau beach alone and without a tent. No tent, no sleeping bag, one dry t-shirt and that little blanket they give you on an airplane. There are some hippies that live in the forests around here and one of them had a lawn chair shipped in by some pirates. He was grilling some kind of bird and I asked him if he minded if I sat in his chair for a bit to rest. He said he minded... (I thought hippies were supposed to be nice). Everyone else I met on the beach was super cool and friendly so I ignored this guy and went over to set up my tripod for some time-lapse photography. Later that night I figured I should try to somehow get some sleep.. so when I was done taking pictures of the stars, I sneaked into that hippies camp and acquired his chair. I set it up a ways down the beach, rolled out my child's-sized sleeping mat (noticed there was a nice new hole in it so it wouldn't inflate) and attempted to lay down. I didn't wanna hang my feet in the sand for fear of little crabs eating me. So I curled up with my camera stabbing me in the ribs and the little red Delta blanket draped over my head. Thankfully it is not very cold in Hawaii but more importantly Thank God that it didn't rain! I have had worse sleep, remembering the time my army friends and I tried to sleep in a freezing Humvee trailer on some MRE boxes as it snowed through the night. But this 'beach-sleeping' is definitely on my list of interesting sleeping predicaments. 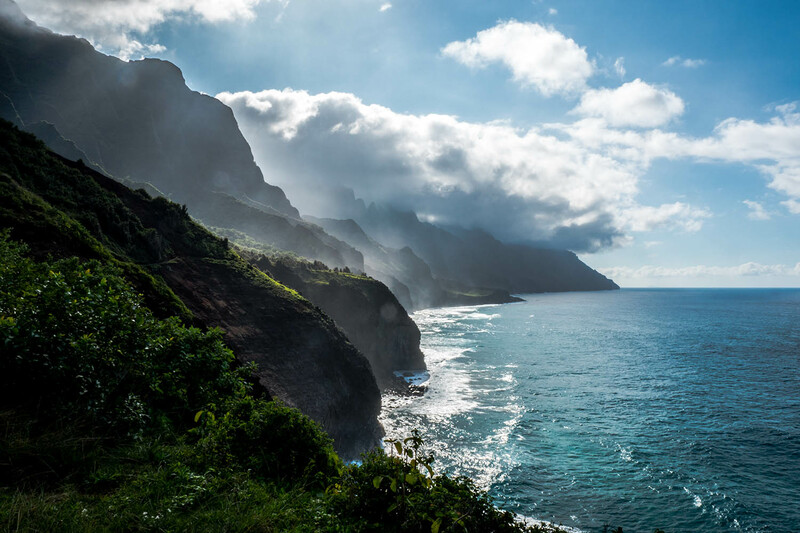 I was especially concerned because the Kauai native I was talking to on the plane said he was laying on a beach just last week and was completely swept away by a rogue wave. I was also concerned that that chair-less hippie would come at me with a chicken bone during the night, but not too concerned. In the end it all worked out, and the thunderously loud crashing waves never got me. I managed to sleep for a few minuets here and there which prepared me for the demanding hike out the next day. 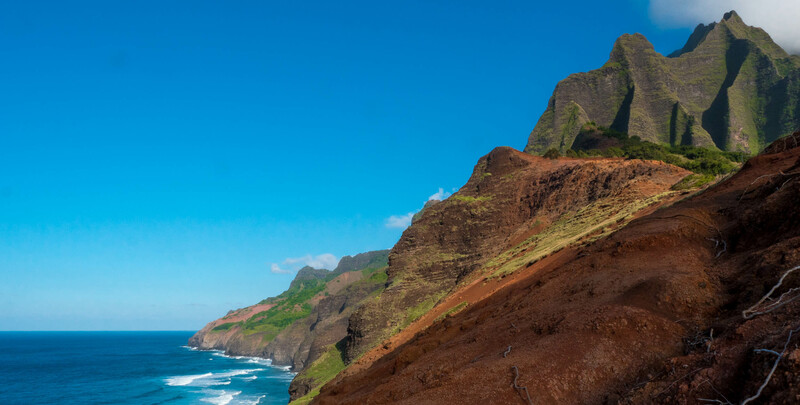 How long is the Kalalau Trail? 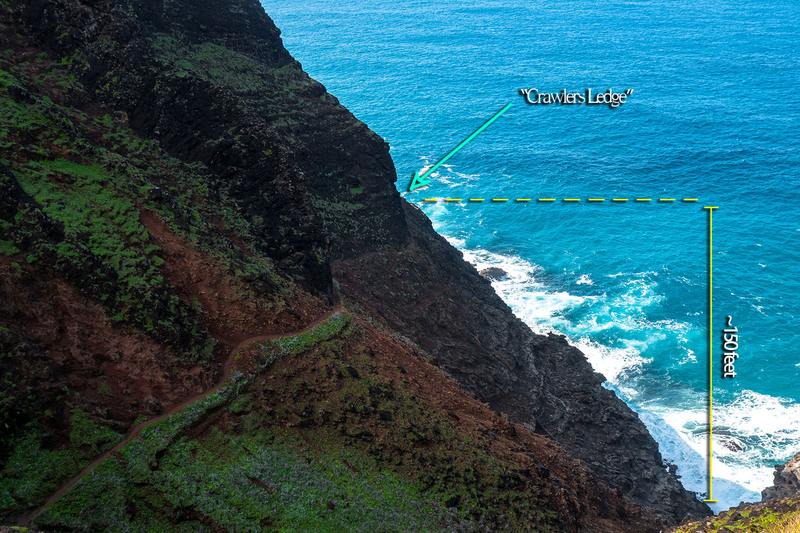 Is the Kalalau trail dangerous? Short answer: yes. The trail is dangerous. There is no phone reception or communication lines of any kind with the outside world and only one trail in and out, the trail you are on. 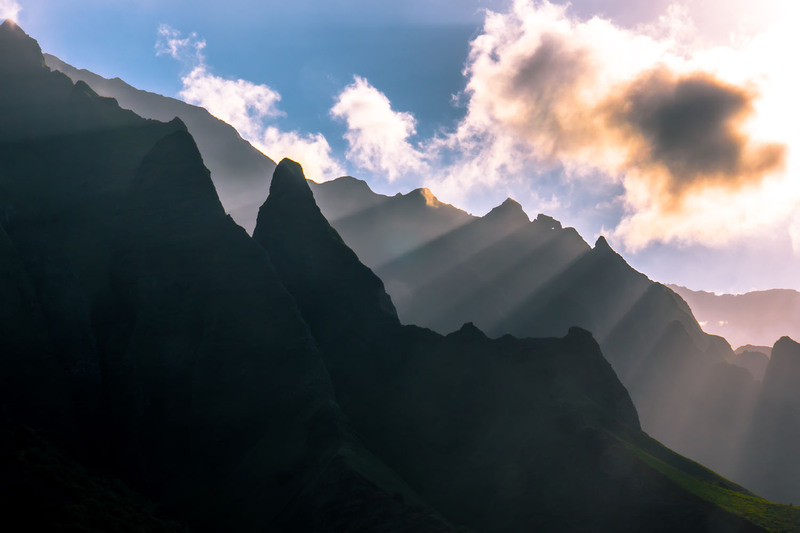 If something happens to you, your only hope is to tell someone of your problems, and have them hike 8 hours back to alert someone who can help. If you break your leg or neck or something, you might try your luck at flagging down a helicopter and somehow communicate with them that you need the coast guard to come rescue you... There are many warning signs for falling rocks, rogue waves, flash flooding, high narrow slippery cliffs.. There is one wooden sign that says how many people have died on this trail in one way or another. Since the number was written in, many more tally marks have been carved into the wood. I think it was at '94' when we saw it. 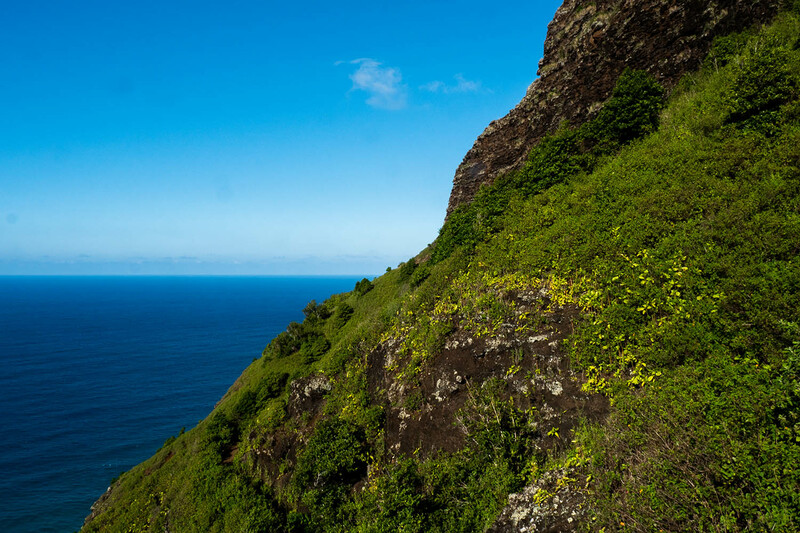 Where do you get water on the Kalalau trail? I brought 6 bottles of water and Iodine tablets. Along the trail your only water sources are rivers and waterfalls, but of those there are many. I got some water from the waterfall on the beach at the end of the trail (a tradition I am told - something like the fountain of youth) and this stuff was crystal clear. I ran out of water and needed to use my iodine tablets and at the end was extremely dehydrated. Is it safe to park your car? 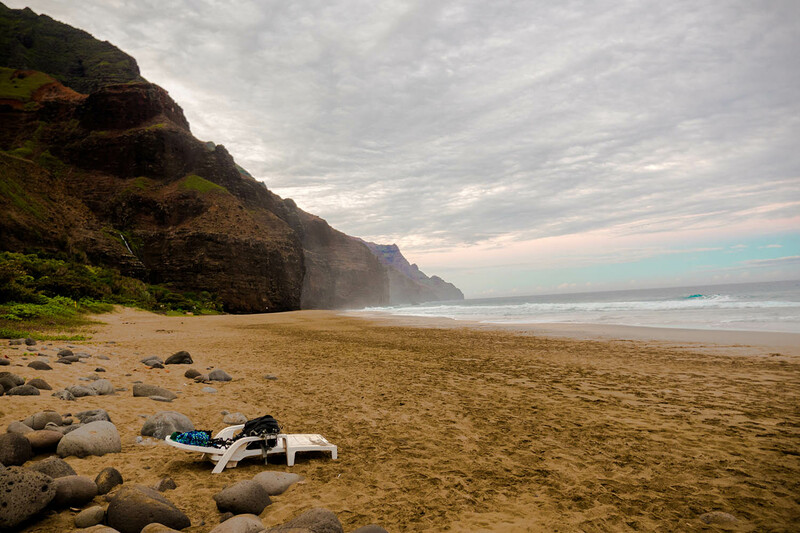 Where should you park your car when leaving on the Kalalau Trail. In the parking lot near the trail head, we have heard several stories of people's cars being broken into. So we decided to park a mile down the road in different beach parking lot which looked much safer. As you drive up the single road to the Trail head, you will see the beach and parking lot that I am referring to, a mile before you get to the trail. 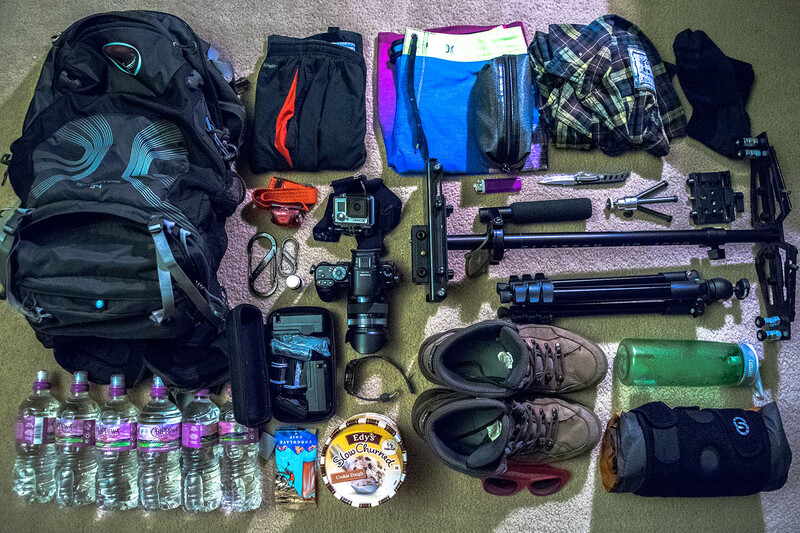 Do you have to camp at the end of the trail or can you do the whole think in one day? I would say it is not possible do go to the end of the trail and back in one day if you wanna do it in daylight. If you attempted to do it at night, I would give you a 50% chance survival rate because you would probably slip off a cliff in the dark. You are so far away from civilization at the end of this trail, you could basically get away with doing whatever you want.. There are naked people on the beach becoming one with nature, there is the occasional hippy going chicken hunting.. As far as camping goes, you could theoretically camp wherever you want. On the beach, in the woods, wherever. As long as you are respecting nature and other people, I think you will be okay. 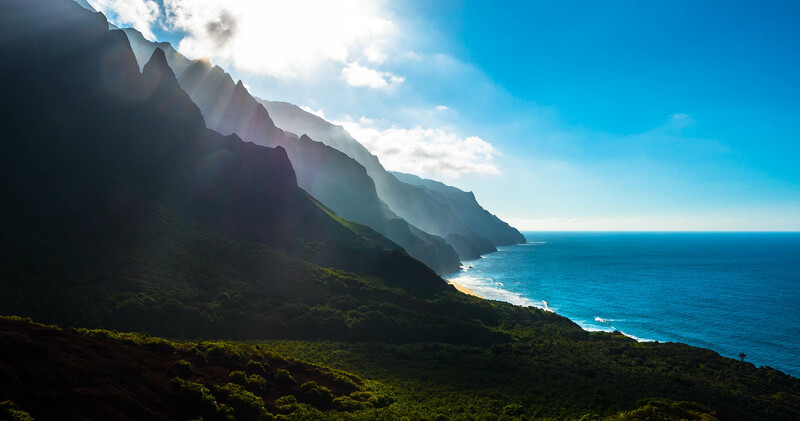 Do you need reservations/permits to camp or hike Kalalau Trail on the Na Pali coast, Hawaii? Pictures you see of crawlers ledge don't really do it justice, you cannot see how high up or how precarious the rocky path truly is. I would liken it to that secret path the Hobbits Frodo and Sam take to get into Mordor. Though it only lasts for less than 5 minutes, there are a couple spots where a slip of your boot would send you catapulting off the edge which would put you in serious trouble if you don't instantly drown from your broken legs... My first time through crawlers ledge I thought it was pretty sketchy. I was alone, my boots were wet and slippery, and there was no one around to help if anything happened. Then on the way back from my journey, a day later, I hardly even realized I was on crawlers ledge. 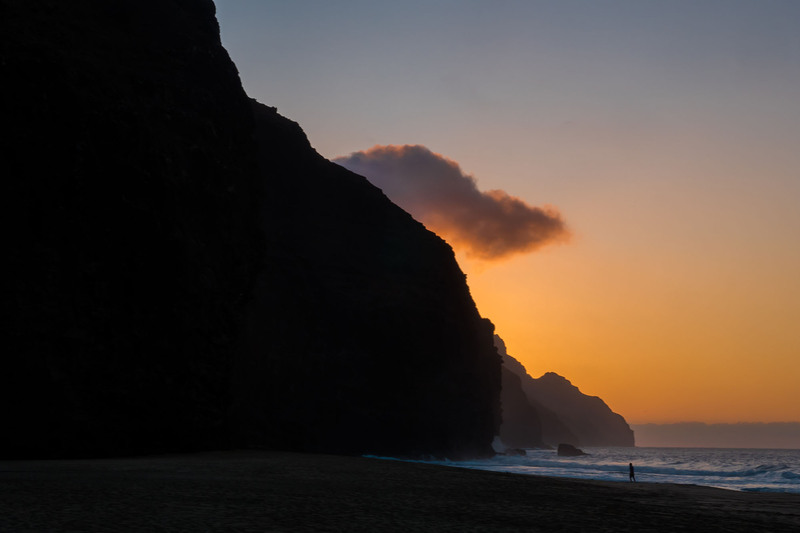 Maybe I was too tired and delirious to care, or I had just become indifferent to the cliffs. There was one point on a different cliff where I was walking pretty fast and realized I better slow it down and actually pay attention to what I was doing, because this cliff was 700 feet up and one slip meant certain death. Can you pass 'crawlers ledge' in the rain? I wouldn't, you would probably fall to your death. 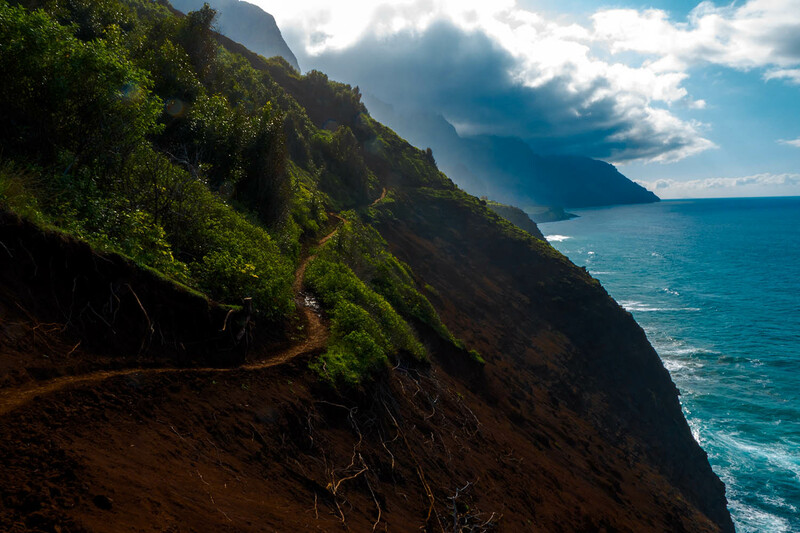 Is the 22 mile, 2 day trek along the Kalalau Trail on the Na Pali coast of Kauai Hawaii worth all the effort? The only picture of me on the trip, some kind woman offered to snap one.